Bliss is the life – Be a lady of leisure and have the daily grind massaged away on a blissful retreat in breathtaking Bali. 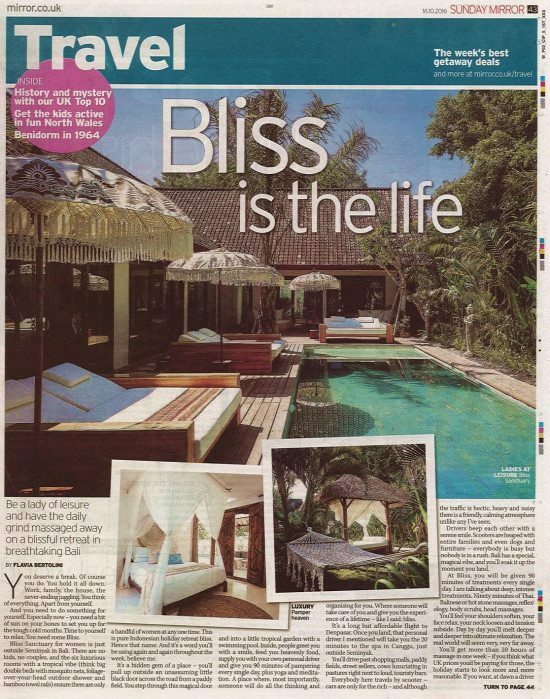 Sunday Mirror: Bliss is the life – Be a lady of leisure and have the daily grind massaged away on a blissful retreat in breathtaking Bali. Time to Bliss the real world goodbye. BOOK IT A week-long basic Bliss Package at the Bliss Sanctuary is on offer at £1,725pp and includes unlimited yoga, massages, spa treatments, food and a personal driver. Extra treatments available at a cost diagnostic massage, spiritual counselling and light therapy. GET THERE Garuda Indonesia flies from Heathrow to Bali via Jakarta from £495 for travel to Oct 17, 2017. Book by Nov 30. Website. TOP TIPS There are mozzies in the tropics so cover yourself in bug spray. Bali is great for shopping, Australians go there to buy lovely fabrics and artisan crafts. Even the weak pound will get you great bargains. You deserve a break. Of course you do. You hold it all down. Work, family, the house, the never-ending juggling. You think of everything. Apart from yourself. And you need to do something for yourself. Especially now – you need a bit of sun on your bones to set you up for the tough cold months. Time to yourself to relax. You need some Bliss. Bliss Sanctuary for women is just outside Seminyak in Bali. There are no kids, no couples, and the six luxurious rooms with a tropical vibe (think big double beds with mosquito nets, foliage-over-your-head outdoor shower and bamboo towel rails) ensure there are only a handful of women at any one time. This is pure Indonesian holiday retreat bliss. Hence that name. And it’s a word you’ll be using again and again throughout the week, believe me. It’s a hidden gem of a place – you’ll pull up outside an unassuming little black door across the road from a paddy field. You step through this magical door and into a little tropical garden with a swimming pool. Inside, people greet you with a smile, feed you heavenly food, supply you with your own personal driver and give you 90 minutes of pampering every single day, plus yoga and meditation. A place where, most importantly, someone will do all the thinking and organising for you. Where someone will take care of you and give you the experience of a lifetime – like I said: bliss. It’s a long but affordable flight to Denpasar. Once you land, that personal driver I mentioned will take you the 20 minutes to the spa in Canggu, just outside Seminyak. You’ll drive past shopping malls, paddy fields, street sellers, cows luxuriating in pastures right next to loud, touristy bars. Everybody here travels by scooter – cars are only for the rich – and although the traffic is hectic, heavy and noisy there is a friendly, calming atmosphere unlike any I’ve seen. Drivers beep each other with a serene smile. Scooters are heaped with entire families and even dogs and furniture – everybody is busy but nobody is in a rush. Bali has a special, magical vibe, and you’ll soak it up the moment you land. At Bliss, you will be given 90 minutes of treatments every single day. I am talking about deep, intense treatments. Ninety minutes of Thai, Balinese or hot stone massages, reflexology, body scrubs, head massages. You’ll feel your shoulders soften, your face relax, your neck loosen and tension subside. Day by day you’ll melt deeper and deeper into ultimate relaxation. The real world will seem very, very far away. You’ll get more than 10 hours of massage in one week – if you think what UK prices you’d be paying for those, the holiday starts to look more and more reasonable. If you want, at dawn a driver will take you to yoga and meditation at the affiliated yoga centre nearby. You can downward dog while farmers busy themselves in the surrounding fields and the imam calls to prayer. It’s an experience that will really move you. The drivers are careful, gentle and patient and will wait for you and take you wherever you want to go. You will even be given a little phone so you can call the drivers to tell them where to pick you up, or the kitchen to let them know you’ll be a little late and to put a plate in the fridge for you. Not that you’ll want to miss any meals. The food is exquisite, you can have amazing mango/banana pancakes with fruit or more traditional fare for breakfast. You can eat lunch whenever you want and order typical Indonesian food as light or as heavy as you like it. But come evening, the group gathers to sample six different dishes that really give you a taste of the island. Salt and pepper squid, chicken curry, chicken satay, seafood barbecue, the list goes on. Plus you can help yourself to snacks including fresh local fruit from the fridge all day. You really can hole up at the spa for the week, but if you want to get out, Cenggu beach is four minutes’ walk away. If shopping is your thing, you can go to Seminyak market and haggle over sarongs, jewellery and arts and crafts. If you want to explore Ubud – just an hour away, made famous by Eat, Pray, Love – it has Hindu temples, Goa Gajah (the Elephant Cave) and rock-cut shrines. For some nightlife, everybody at the spa gets taken to drink cocktails and see the amazing sunset at hip outdoor Potato Head Beach Club. Sounds unglamorous, is actually very glamorous – and will give you one of the best sunsets you’ve ever seen in your life. Half an hour away in Legian is the Bali Beach Shack, a long-running Aussie-owned restaurant and bar that is known for its cabaret shows featuring the best of the island’s drag queens battling it out on stage. That should be enough for the week. 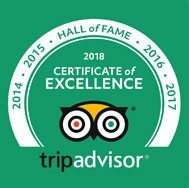 The caring staff and amazing treatments will make this a unique experience – one that will stay with you for a long time to come. So go ahead, do this for yourself. Give yourself some bliss.